Reduce your Packaging, Decrease your Costs. Your palletizing line and your slip sheet pneumatic gripper require that you use corrugated cardboard. How do you avoid gripping faults on your palletizing robot while using slip sheets lighter than corrugated cardboard? 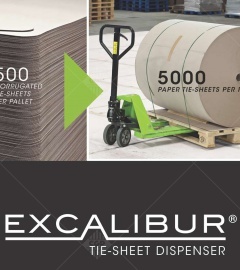 Our solution: EXCALIBUR®, the automatic roll-fed slip sheet cutting machine. EXCALIBUR® installs in place of the conventional pre-cut slip sheet magazine. Single slip sheet formats are cut. One single slip sheet is presented to the palletizing robot at a time. There is no risk that the gripper will release the slip sheet or take several sheets at a time. The slip sheets are placed fluidly and does not cause line stoppage. You thus reduce the operating costs of your palletizer and the cost of your consumables. Integrate individual slip sheet cutting with EXCALIBUR®, our slip sheet cutting machine. A pallet of 500 cardboard slip sheets is replaced by a roll of lightweight paper containing 5,000 sheets. You simplify your flows and streamline your inventory.